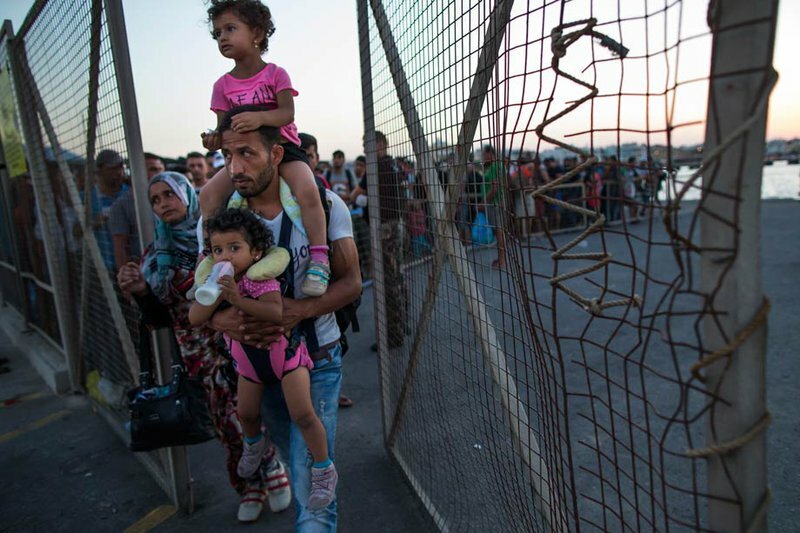 Migrants and refugees walk to board an Athens-bound ferry at the southeastern Greek island of Kos in August 2015. Alexander Zemlianichenko/Press Association. All rights reserved. This autumn, the member states of the United Nations will come together to pledge to fully protect the human rights of all refugees and migrants, regardless of status. They will commit to a “people-centred, sensitive, humane, dignified, gender-responsive and prompt reception” of large movements of migrants and refugees. It is an historic opportunity to rally governments and others to rights-based action on a defining issue of our times. It is also a critical moment to clarify the situation of those migrants who are not refugees in these large movements, which are almost inevitably composed of people with diverse reasons for movement and protection profiles. The lack of a universal definition of what we mean by a ‘migrant’ has compounded the analytical quandary that such ‘mixed movements’ present. At best, we are left to understand that an international migrant can mean someone who is outside their country of nationality or citizenship regardless of the way they left it and their intentions for doing so. International human rights law provides the bedrock of protection for all people on the move, regardless of their subsequent categorisation. This lack of accepted terminology has confounded the often well-meaning – and occasionally more sinister – attempts to distinguish refugees (as defined in Article 1 of the 1951 Convention on the Status of Refugees) from migrants (an amorphously defined group of people, which may or may not include refugees as well as other more precisely defined categories of people). The desperate, precarious movements of women, men, and children that we have witnessed even in the course of the last two years – the hazardous and costly journeys through Central America and the Sonoran desert, across the Andaman sea and the forests of Southeast Asia, the deadly paths through the Sahara desert and the Gulf of Aden, the perilous Central Mediterranean crossings, and the dangerous routes across the Aegean and through the fields and forests of the Balkans – cannot adequately be described as dignified and protected for anyone involved. In the first eight months of 2016, the International Organisation for Migration (IOM) reported that 4,226 migrants had lost their lives along migratory routes. This figure is almost certainly a significant under-counting, with the actual figures of migrant deaths en route and at international borders likely to be much higher. For sure, it is a refugee crisis. Much more needs to be done to stress that refugees are rights-holders, entitled to claim their human rights – to liberty, to health, to education, to housing – and not just at the whim of charitable impulse. We should for instance urgently challenge the notion that protection for refugees can mean indefinite ‘warehousing’ in dilapidated camps, often living in a legal limbo, and unable legally to work. When the international community adopted the Universal Declaration of Human Rights on 10 December 1948 it was accepted as “a common standard of achievement for all peoples and nations”, spelling out for the first time in human history the minimum civil, political, economic, social, and cultural rights that all human beings should enjoy. The international bill of rights makes exceptions between nationals and non-nationals with respect to only two rights – freedom of movement and political participation – and only then in limited circumstances. Simply put, all human beings have all human rights. International human rights law provides the bedrock of protection for all people on the move, regardless of their subsequent categorisation into more specific groups with more precisely defined entitlements. And yet at the same time, those migrants who are not refugees are frequently neglected in the response to these movements. ‘Migrants’ are often assumed to be whoever remains after the refugees have been identified from within a group of new arrivals. Because refugees are forced to move in dire circumstances, the converse logic posits that all those who are not refugees are moving voluntarily for the sole reason of wanting more agreeable opportunities. They can go back as easily as they left, and thus it is further assumed that these ‘left-over people’ are not in need of any kind of protection. While some declare that migrants are interlopers in these large movements – taking up the space that should rightly belong to those more deserving – still others contend that they are not the holders of rights at all. As research and migrants themselves increasingly tell us, this is not true. We know that people who move out of necessity rather than free choice are more at risk of human rights violations during their migration, and are less able to make independent decisions or to formulate exit strategies if their migration doesn’t go according to plan. Migration is a dynamic process, and varying degrees of coercion and voluntariness characterise each individual’s experience regardless if international law considers them a ‘refugee’ or a ‘migrant’. Analysing and exploring the parameters and limits of the vulnerability of migrants who may not qualify as refugees gives us an opportunity to go beyond the binary refugee/migrant divide. It also helps us to understand the diversity of migratory experiences that exist in any large movement of people, and brings more clarity to the emerging concept of ‘migrants in vulnerable situations’. Vulnerability related to the reasons for leaving countries of origin: The drivers for ‘non-voluntary’ precarious movement are multiple and often intertwined. They include poverty, discrimination; lack of access to fundamental human rights, including education, health, food and water, and decent work; violence; gender inequality; the wide-ranging consequences of natural disasters, climate change, and environmental degradation; and separation from family. While in certain circumstances some of these grounds could lead to a claim for refugee status under the 1951 Refugee Convention, not all will. It does not serve migrants well for us to assume that they are dependent on the charity of states. Vulnerability related to the situation encountered by migrants en route, at borders, and in the context of reception: People are often compelled to utilise dangerous means of transportation in hazardous conditions, and to resort to the use of smugglers, agents, and other types of facilitators. This places them in situations where they risk exploitation or abuse, and puts them at risk of the many crimes included under the umbrella of trafficking. This journey can be marked by hunger, deprivation of water, a lack of personal security as well as of access to medical care. Many migrants can spend long durations in transit countries. Often there in irregular and precarious conditions, they are unable to access justice and are at risk of a range of human rights violations and abuse. The inadequate and often harsh conditions in which they are received at borders can also violate rights and further exacerbate vulnerabilities. Vulnerability related to a specific aspect of a person’s identity or circumstance: As they move, some people are inherently more vulnerable than others due to unequal treatment or discrimination based on factors including age, gender, health status, disability, ethnicity, religion, nationality, religion, language, sexual orientation, gender identity, or migration status. Certain people such as pregnant women, persons with poor health conditions – including those with chronic diseases, persons with HIV, tuberculosis or hepatitis – persons with disabilities, older persons, or children (including unaccompanied or separated children) are more vulnerable due to their physical and/or psychological conditions. Definitions are immensely important in the field of migration, and being included into or excluded from one or another category can mean the difference between life and death. It’s therefore ironic – tragically so – that we lack a universally understood word to describe those migrants in extraordinary situations of vulnerability and risk; these ‘survival’, ‘precarious’, or ‘vulnerable’ migrants. Migrants too are rights-holders, entitled under international human rights law to claim specific entitlements from duty-bearers. It does not serve migrants well for us to assume that they are dependent on the charity of states and the international community, or that well-defined obligations under human rights law and related standards are somehow trumped by good wishes, ‘good practices’ or ‘operational tools’, no matter how well-intentioned. In light of the particular challenges of protecting migrants in vulnerable situations, there exists today an emerging understanding – led by the United Nations Office of the High Commissioner for Human Rights – of the need to articulate a set of principles to guide and give effect to the legal obligations of states towards such migrants. Guidance would include what the best interests of the child principle should mean for migrant children in transit who may not be entitled to claim asylum. Or standards on the establishment of firewalls between immigration enforcement and other officials, to enable migrants in an irregular situation to access public services or to approach community police to report crimes. Or the importance of securing not only the lawfulness but also the sustainability of returns for those who are not entitled to remain, including through effective reintegration programmes and monitoring mechanisms. Fear of the ‘migrant bogeyman’ is leading us to disregard the real harm done to our societies, not by those vulnerable individuals who seek only safety and dignity, but by the encroachment on our values that we allow in the name of this fear. Today, rather than measures to facilitate mobility and protect the rights of those moving, we are witnessing the creation of increasing barriers to international migration generally, with a drastic impact on rights and dignity. Such control measures include legislation that criminalises irregular emigration; age and sector-specific bans on the movement of potential migrants; and the externalisation of migration controls such as carrier sanctions and onerous visa requirements. Sizeable industries have formed to meet the demand for fences, walls, surveillance systems, and interception and pushback. Corruption flourishes along these long and dangerous routes, which exacerbates risks, prolongs journeys, and disproportionately impacts the poor. Rather than acknowledge compelling labour market demands for migrant workers in specific (often low-skilled) sectors, utilise the potential of expanded education or humanitarian visas, or meet the real needs for family reunification, policy responses on migration have emphasised punitive and deterrent measures. These often fail to meet their goal of containment and at the same time make little real attempt to understand the motivations and human rights protection needs of migrants who are at risk and in vulnerable situations. In electing to discuss the situation of refugees together with migrants on the 19 September, the international community has recognised formally what is increasingly a truism: that it is as vital in the ‘management’ of migration to have a principled, comprehensive, and responsive system of migration governance as it is to ensure fair and effective asylum systems and refugee responsibility-sharing frameworks. In promising to protect the human rights and dignity of all migrants and refugees without discrimination, the New York Declaration pledges the support of member states of the United Nations to those “affected today as well as to those who will be part of future large movements”. It is time to put these noble ideals into action. The gulf between the commitments made in the New York Declaration and the reality of xenophobia, hatred, and divisiveness that migrants and refugees face on a daily basis is remarkable. Listening to the public narrative on migration, it can appear that the common sets of laws, institutions, and values that bind us together do not count when we speak of foreigners in our societies. That somehow their rights, their dignity, and their contributions are less important than our fears. The pernicious effects of these fearful migration measures are being felt as much by ‘us’ as by ‘them’. Fear of the ‘migrant bogeyman’ is leading us to disregard the real harm done to our societies, not by those vulnerable individuals who seek only safety and dignity, but by the encroachment on our values that we allow in the name of this fear. Freedom of speech and expression are being curtailed rather than reveal the reality of abuse in migrant detention centres, people and groups who assist and protect migrants are sanctioned through criminalisation and counter-smuggling laws. Draconian emergency laws infringe on civil liberties on the pretext of regulating migration, migrants and citizens alike are caught up in webs of surveillance, and deals are made with dictators and human rights abusers to return migrants or stop them from coming in the first place. Our societies are poorer because of such measures. Societies built on the foundations of human rights and the rule of law are instead becoming distorted and defined by the moral panic on migration. And in the end the pernicious effects of these fearful migration measures are being felt as much by ‘us’ as by ‘them’. The foremost challenge for the United Nations summit, therefore, and for the two-year process that will follow, is that it must help us come together to shape a different vision for our societies in this globalising world. It must affirm the commitment of the international community to societies that are stronger and brighter not despite migrants, but because of them; not despite the welcome that we afford migrants, but because of it.